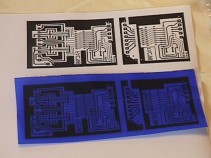 Photocopy or Laser Print circuit image onto the dull side (emulsion) of Press-n-Peel Image Transfer Film. Prepare: Clothes Iron, Steel Wool #00 (or SOS/Brillo with all the soap washed out), Packaging Tape,Photocopy or Laser Printed Circuit Image, & Directions. 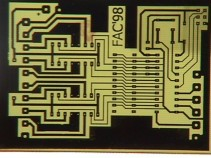 Cut Press-n-Peel, leaving a 1/4" border around the circuit image. Cut board to size. 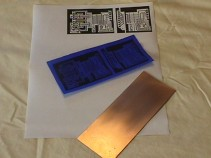 Place Press-n-Peel with image face down onto clean copper board. 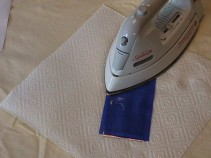 Iron the Press-n-Peel Film to the board a peice of plain paper between the iron and the film to reduce friction. Temperature setting on the iron is critical, and dependant upon your laser printer or photocopier. Suggested starting temperature is 275-325 degrees F. Iron setting is generally "polyester". Iron temperatures vary. Iron until board has completely and fully reached the temperature of the iron. Time varies with the size and thickness of the board. Generally this is 1.5 to 10 min. DO NOT USE THE STEAM SETTING! Quench the board/film combination under cold running water. Peel the film off. 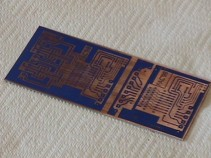 To remove small "fills" in between traces and "filled donuts", cover the imaged copper board with clear packing tape, and then remove. This will pull all unwanted filled areas off the board. 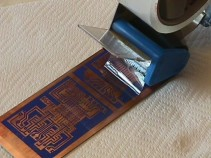 Using steel wool, scrub the Press-n-Peel image off as to reveal copper traces. This is best done under running water. Suggestion: Do not do this until your ready to drill and populate the board. 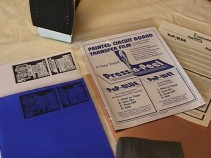 The Press-n-Peel transfer resist protects the board from oxidation.